Give your usual buttercream frosting a kick with instant coffee. 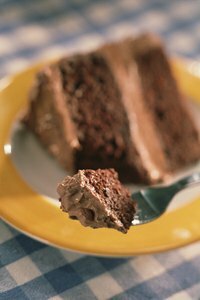 Quick-and-easy coffee-flavored buttercream frosting makes a perfect topping for chocolate cakes and cupcakes. Wait until you're ready to ice your dessert to whip up the frosting, however, because it doesn't spread as well after sitting. Attach a whisk attachment to your standing mixer. Soften the butter by leaving it on the counter for a hour before you start the recipe. Whisk together the softened butter and confectioner's sugar. Start on slow speed until the sugar has blended with the butter. This will the sugar from jumping out of the bowl. Then switch to medium for 3 minutes. Add the vanilla and strong instant coffee, and continue to whisk for another minute. If the frosting is too thick, you can add a little bit of heavy cream until it is the right consistency.